Mike Jackson learned to play guitar the hard way - on the bandstand. He received his first guitar for his 12th birthday in 1956. It was a Stella flat-top accoustic purchased from a pawn shop by his mother for the princely sum of $15.00. The first tune he learned to play was Bill Doggett's "Honky Tonk," one of the great Rhythm & Blues hits of the 50s; Mike still includes it in his repertoire. He took his only guitar lessons ("About ten of them," Mike says.) from the late Bill Harris, a legendary Washington, D.C. blues, jazz and classical guitarist who was a member of the original R&B group "The Clovers." Harris pioneered the classical style of jazz guitar later made popular by Charlie Byrd. "At that time I didn't take to the discipline of serious study," Jackson says, "so I quit taking lessons and just started practicing on my own and hanging out with guitar players and other musicians." By the 60s he was a veteran of the Washington, D.C. nightlcub scene and the so-called "Chitlin' Circuit" of black theaters and nightclubs throughout the northeast and south. "We played some tough places like 'John Brown's Farm' in West Virginia and 'Evans Grill' in Maryland," he says. "You could find pork chop bones on the floor carbon dated to 1909 - these were some soulful joints, let me tell you!" On the theater circuit he also played the Apollo (New York), the Royal (Baltimore) and the Howard (Washington, DC). In the late 60s he toured Europe with Big Al Downing, an R&B pioneer who was often compared to Fats Domino. Downing's music even took Mike into the Country & Western realm. "Al was crossing over before it became fashionable," Mike says. While still in his teens Mike backed up such popular artists of the day as: Solomon Burke, Baby Washington, Clyde McPhatter, The Marvelettes, Marv Johnson, Marvin Gay, Billy Stewart, Johnnny Stewart and many others. 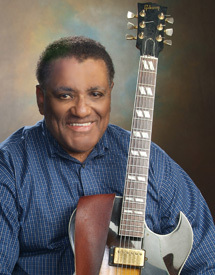 He appeared on shows with just about every major R&B and rock artist of the 60s. In 1968 Mike turned his attention to jazz. His first jazz gig was in the lounge at Pitt's Hotel in northwest Washington, DC where he played with organist Bill Clark and drummer Vance James. It was a formative time for him where he got to play with and learn from many traveling musicians who came through town like Jack McDuff, Milt Jackson, Johnny Hartman and others. He went on to play with many popular DC jazz musicians like drummer Billy Hart - with whom he had played R&B gigs as a teenager - organists Garland Butts, Skip Fennell, Orlando Smith, Freddie Johnson and Jackie Hairston, and a host of other prominent DC players of the day. "Moving from R&B to jazz just seemed to make sense to me," Mike says. "I liked the more sophisticated melodic structures of jazz and it just seemed like the right direction to go." His early jazz influences were Barney Kessell ("I nearly wore out the recording of 'Carmen' by Kessell and Andre Previn," He says. ), B.B. King, Johnny Smith, Kenny Burrell, Wes Montgomery, Howard Roberts and Grant Green, the latter being the greatest influence on his style of play. "Grant Green played with a warm, groovy, laid-back feeling that nobody else could quite duplicate," Mike says. "His playing was very approachable and very easy to like."